Continuing with the swooping 'S' arm, this Victorian gas wall light reproduction also features an acid etched hexagonal glass and uses the cast embellishments perfectly. A lovely contrast against the smooth brass tubing. Perfect in pairs anywhere you feel comfortable placing it. 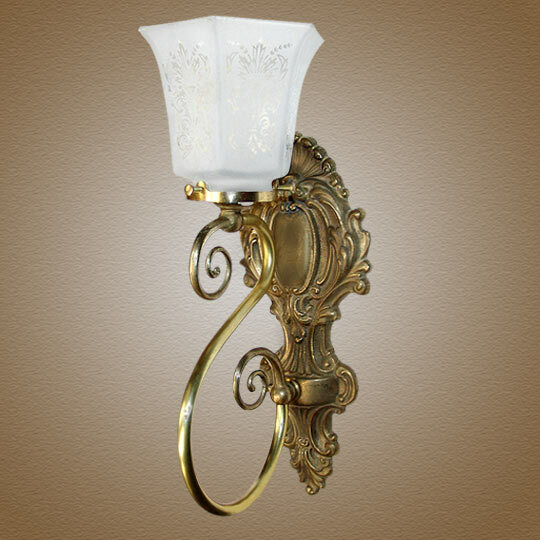 As with most of our sconces, many custom options are available including a multi arm design and alternate metal color and glass. Shown in Raw Brass. Available in different Metal Finishes, different Glass, Back Plate, multiple arms and many other Custom Options. Width 5.5 In. / Projection 10 In. / Depth 11 In.